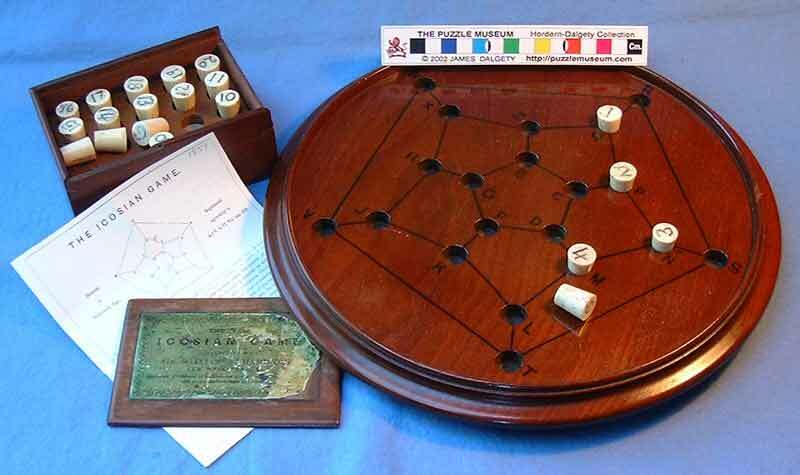 An original copy of Sir William Rowan Hamilton's famous "Icosian Game". There are only three other known examples of this puzzle. Sir William Rowan Hamilton, who was Astronomer Royal of Ireland, invented the puzzle in 1857. He sold the rights to Jaques for £25. Hamilton gave his name to the mathematical field of "Hamiltonian Circuits". The pieces are conical bone or ivory plugs. The puzzle museum only has a photocopy copy of the original rules, which give 15 example puzzles. Hamilton intended that one person should pose the puzzle and a second person solve it. The until recently, only information we had on "The Travellers Dodecahedron" was its description in a chapter on Hamilton's Game in volume 2 of Édouard Lucas' "Récréations Mathématiques" and another mention in the 3rd edition of Ahrens' German work on Recreational Mathematics. We knew of no actual examples of the puzzle; so we were very fortunate to find this example complete, and in almost new condition. 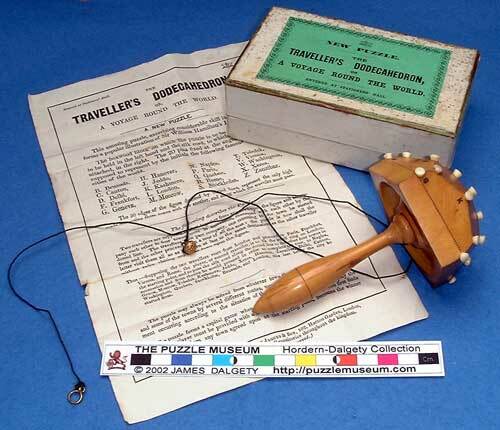 The "Travellers Dodecahedron" poses no dilemma about being a game as it clearly says "New Puzzle - The Travellers Dodecahedron or A Voyage Around the World". It is not a true dodecahedron but is a "schematic" on a boxwood "mushroom". The silk cord has an attractive brass ring and heavy button to make it pleasant to play with. 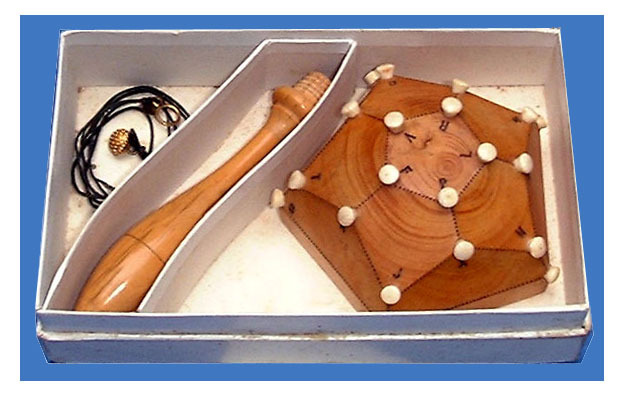 The rules have been simplified and made much more attractive than the original "Icosian Game". The 30 edges represent the only roads that you are allowed to pass along as you visit the 20 ivory pegs that represent cities. Two travellers set off visiting 4 neighbouring towns. One returns home and the other continues to travel around the world trying to visit all the remaining cities once only. As an early mechanical puzzle, a route-finding puzzle, and as an interesting part of the history of mathematics, this puzzle is a wonderful addition to the Hordern-Dalgety Collection.